Well, on to the central theme of this How To. Bearing a bear. I shall use the risk management techniques I learned many years ago as a project manager and apply some of the lessons I now provide to aspiring and new project managers in my avatar of Old Member Who Hands Out Gyan Unasked. Gyan? Gyan is knowledge. Gurus give gyan. Also, insufferable old men well past their prime. 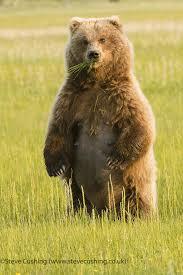 The first thing to do when faced a bear is to positively identify that you are, indeed, faced with a bear. Look at the characteristics of the creature. This is the first thing that you will probably notice. Look carefully. Is the thing white, black or brown? If you answered “Yes” to any of those colours, you may have a bear. Is it on all fours? Is it rearing up? Count, quickly, how many limbs it has. Check size and type of limbs. Does it have four of more or less the same size and type? If not, then estimate the relative differential between hind limbs and fore limbs. Does it have hoofs or claws? If claws, you may be faced with a bear. How big is the beast? Is it on it’s hind legs and towering over you? It would help if you know how tall you yourself were. Keep this information handy with you, possibly carved on a bracelet that you wear at all times. If the beast is white or black and your forehead only reaches to its chest and you are less than 5” 6” and if it has claws, you may be looking at a polar or grizzly bear. If it is 18 inches high, is wagging it’s tail and looking at you balefully, while spitting, you’re in front of an angry cat. Check teeth. Are they sharp, with incisive-looking incisors? If yes and all the other factors above point to it too, you’re probably looking at a bear snarling at you. Is this thing covered with fur? Does it look like real fur and not something obtained from a shopping mall? If yes, you have a bear. Consider your geographic location. Do you live in the general vicinity of the Rockies and the beast is black, large and all other evidence points to a bear, you are probably facing a grizzly. If, however, the creature has an long snout and a thin tongue that snaps in and out and it is about 2 feet high and it is snuffling around near the floor and you live in Uruguay or Brazil you are probably seeing an anteater. If it is icy cold outside, you’re in Nunavut and the thing is white and has all the characteristics of a bear, you, lucky devil, are seeing a polar bear with your naked eye. Consider the points above together with your past experiences of watching Animal Planet or National Geographic Channel. A careful study of all characteristics will help you correctly identify the growling, snarling thing as a bear. To properly identify an appropriate response, it is necessary to assess the likelihood of being attacked. If the creature backs away on seeing you, with a panic stricken face and averts its eyes, you have forgotten your makeup and / or your hair is a mess. The probability of being attacked is close to zero, as the creature is probably already beating a hasty retreat muttering and gibbering under it’s breath. If however, you feel your lungs are losing air, your limbs are crackling and you are smelling the worst breath since the day after your wedding, you are likely in a bear hug and may have only a few minutes to live before your ribs collapse into your lungs and you lose consciousness. In this case, the probability of attack is 1, or sure to happen. In which case, in real terms, you no longer have a risk but an issue. Consider what would happen if you are attacked. Rate this from a zero, where nothing more exciting happens other than a posting on Facebook to a 1 if you are already dead from the bear hug. Once you have figured out the Probability and Impact, consider how easy it will be to detect if an attack occurs. Blood from gashed veins could be an easy sign. Actually, in this case, detectability is quite easy. Rate this accordingly. Now that you have identified, hopefully correctly, that you are faced with a bear and have carefully considered the probability of attack, the impact of the attack and how easy it will be to detect that an attack has occurred, and thus have a good, widely-accepted rating for this risk, consider your options to address it. You may call a friend, if you have time, or the internet. It is usually a good idea to consider a few different options and evaluate them against the risk rating. Facebook or Instagram are usually not considered great options, as you are likely to get a socially aware post regarding the human effect on animals in the wild, in the case of Facebook. I have no idea what the hell Instagrammers do. Hopefully, you have a few options available to you. Select the one most appropriate. Usually, screaming at the top of your lungs, hysterically, of course, is not considered a good option. Expert advice usually provided says that you should stay calm and make soothing noises. Mabe sing a lullaby or two. Of course, if your singing voice is like mine, scrap the singing. Shooting the thing may be a good idea at the time, but then you will have to face the wrath of Facebook ( see animal awareness above ). On the other hand, your encounter may go viral especially, if the response plan includes recording video of the affair. Execute developed plan that you just developed. Or run away, screaming with all thoughts of plans and risk ratings absent from your mind. This is listed as the worst thing to do. If you’re not dead yet. Cat??? Seriously! !! I would only die of laughter. …..
Haha.I will do all this when I come across a bear,and name you as my killer too.But who will ever know? So true! Too bad, though! Thanks for coming by, first timer! I hope to see you back here soon.